The best place for you to start looking for a job is Glassdoor. In our tests, it had the most new jobs posted every day. It complements that freshness with an in-depth look at the companies posting them. These eye-catching multimedia company profiles are balanced with anonymous feedback from current and former employees on culture, salary, and the CEO — there are even charts to show how a company’s rating has changed over time. Glassdoor gives you both the info you need to find job opportunities and the context to see if it’s a good fit for you too. When it comes to pure coverage, though, Indeed is the heavy hitter. Its aggregation algorithms were unparalleled in our test, meaning there’s a better chance that jobs posted on other random job boards, sites, and companies across the web will show up here. Plus, it’s one of the only sites from our top picks that lets employers post openings for free, making it a first stop for lots of companies. 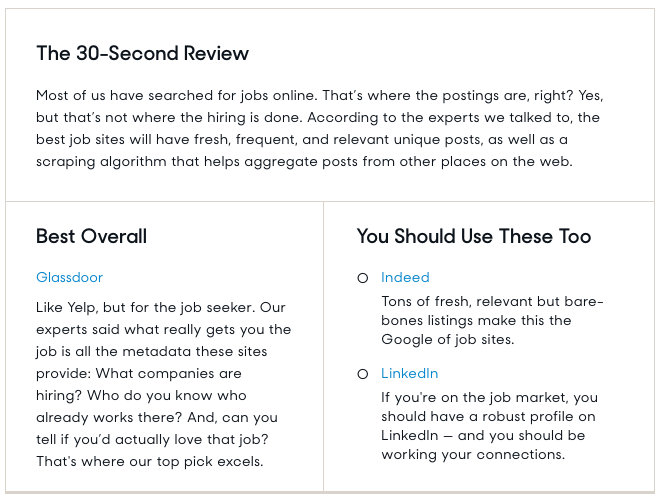 It’s pretty bare-bones, though, and because it’s such a good aggregator, you often get ping-ponged between job sites, instead of the actual job posting, which leads to a less-than-stellar user experience. We can’t not mention LinkedIn. When it comes to job posting, it’s middle of the pack, especially compared to Glassdoor and Indeed. But it’s such a powerful working tool we’d be remiss not to recommend it. LinkedIn’s most powerful feature: It shows job seekers networking pathways to help score introductions, the first step to getting an internal referral. Read the full article here.